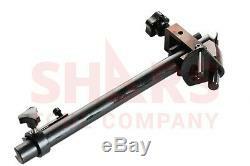 Shars Universal Cutter Grinder Sharpener for End Mill/Twist Drill/Lathe Cutter U3 New. Export to Germany U3 Model. Stop throwing away used 1/81 HSS &. Carbide end mills & drill bits. 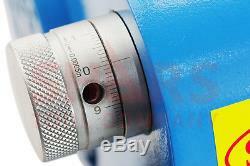 Clamping diameter of 5C collet: 1/16"-1". Cup wheel: 4" x 1-1/4" x 2. Tool post longitudinal travel: 5-1/2. Taper angle ground: 0-180 deg. Negative taper angle ground: 0-52 deg. Relief angle ground: 0-45 deg. 1/3 HP, 1 Phase 110 Volt, 3340 RPM, 3.58 APM Motor. 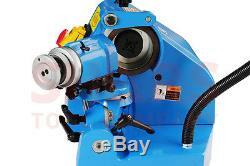 Niversal Cutter Grinder, with development of the carved industry, precisely designed by engineers. It is made up by main unit, wheel, spindle, drives, micro-feed and the grinding wheel dresser, knife the composition, structure, novel, modeling beautiful, high precision, good performance, easy to use, easy. 1 Sharpen and fix Carbide and HSS End Mill/ Twist Drill, turning tools, single, double & ball end End mill. And milling cutter blade cutting edge. Omputer engraving machine, machine engraving machine, engraving machine. HSS and carbide engraving cutters as well as single lip or multiple lip cutters of various shapes such as radius cutters or cutters with a negative taper angle. 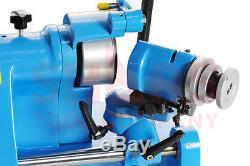 High-speed rotary die knife cone head, edge grindingm oldt. 1/3 HP, 1 PHASE 110 VOLT, 3340 RPM, 3.58 APM MOTOR. 4" X 2" STRAIGHT-UP STYLE WITH 1-1/4 BORE 80K GRIT. UP TO 13/16" X 13/16". 4" X 1-1/4 WITH 1-1/4" BORE 320 GRIT. 1/8", 1/4", 3/8", 1/2", 5/8. The wheels are the bottom line, if the wheels are no good the machine is no good. Our wheels are produced using General Electric abrasive media under strict conditions to ensure long life. The wheels are high quality Taiwan wheel. Runout < 0.0005 on the main grinding spindle to ensure precise grinding. More than 1000 German Customers are very satisfied. The universal index head is provided at 24 positions so that any particular angle of shape can be obtained, free 360° is allowed for grinding End Mills, Twist Drills, and Lathe Tools. 24 Indexing would be 15 degree per index but not able to index into 60 degree and 210 degree if 0 degree is used as the starting point. 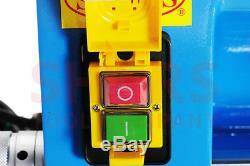 When it's reached upon this 2 position one would need to reset the starting position to bypass this restriction. 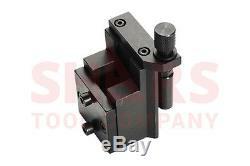 Both the spindle and the rail are micro-adjustable to 0.0005 with easy to read laser marked lines on the vernier. 24 point positions in 15 degree increments can be indexed at the tool holder's scale indexer when the release lever is pull into the right side position as shown in the photo below. Smooth rotary movement on each joint to facilitate the grinding process on those necessary relief angles. Multiple attachment accessories are included to enable sharpening end mills, drill bits, carbide tipped lathe tools, reamers, and punches. END MILL & REAMER SHARPENING ATTACHMENT. TWIST DRILL BIT SHARPENING ATTACHMENT. WHY DOES OUR GRINDER EXPORT TO GERMANY MORE THAN 1,000 UNITS PER YEAR? Our grinder uses a special grinding motor, built-in custom bearings, and seals which provides it with a longer motor life and allows it to run more soundlessly than other ordinary grinders. Solenoid switch has been used which ensures in cases of a sudden power outage, power phase loss, or other emergency situations that the switch will lose power first and protect the safety of the motor in order to improve electrical safety. All Grinders handles use adjustable handles which have more flexibility. 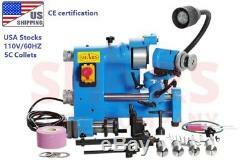 All Grinders main parts are manufactured to exact technical requirements. Through multiple heat treatment processes, the grinder's durability and accuracy is greatly improved. Each Grinder has to pass German quality standards and large quantities are exported to European markets. The universal clamp assembly is the most important part to ensure the grinders precision. Each Grinder has a manual and stamped factory certificate. Also, there is a serial number on each box which can traced to the original information about each grinder. 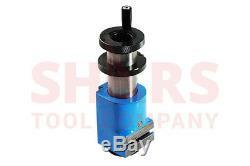 End mill & reamer sharpening attachment. Twist Drill bit sharpening attachment. 5C collets: 1/8", 1/4", 3/8", 5/8", 1/2. 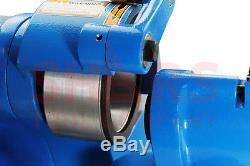 4" x 1-1/4" 320 Grit diamond grinding wheel with 1-1/4 bore for grinding carbide. 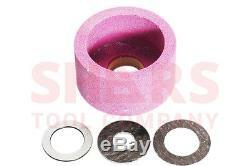 4" x 2" 80K Grit silicone-carbide straight-up cup wheel for grinding high speed steel. Wrench for mounting the diamond wheel. Taiwan wheel with 3pcs wheel spacers. END mill grinding attachment:diameter 1/81(3-25mm). 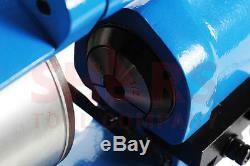 Twist drill grinding attachment:diameter 1/829/64(3-11mm). Up to 13/16 x 13/16. Straight Cup Wheel 80k grit 5300 max RPM. 5C collets 1/16"1" see the following pages. 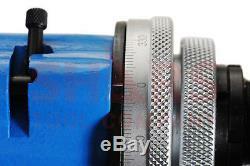 Grinding wheel adapter for 1-1/4 arbor hole. The item "Shars Ce U3 Germany Type Universal Cutter Sharpener For End Mill/Drill 110V New" is in sale since Thursday, October 8, 2015. This item is in the category "Business & Industrial\CNC, Metalworking & Manufacturing\CNC & Metalworking Supplies\Equipment Specific Tooling\Grinding".